Need a speaker to ENGAGE, EDUCATE, and INSPIRE your group? 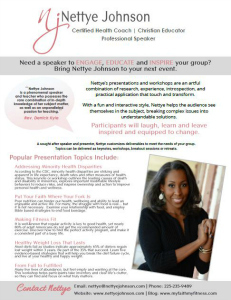 Bring Nettye Johnson to your next event. Nettye’s presentations and workshops are an artful combination of research, experience, introspection, and practical application that touch and transform. With a fun and interactive style, Nettye helps the audience see themselves in the subject, breaking complex issues into understandable solutions. inspired and equipped to change. 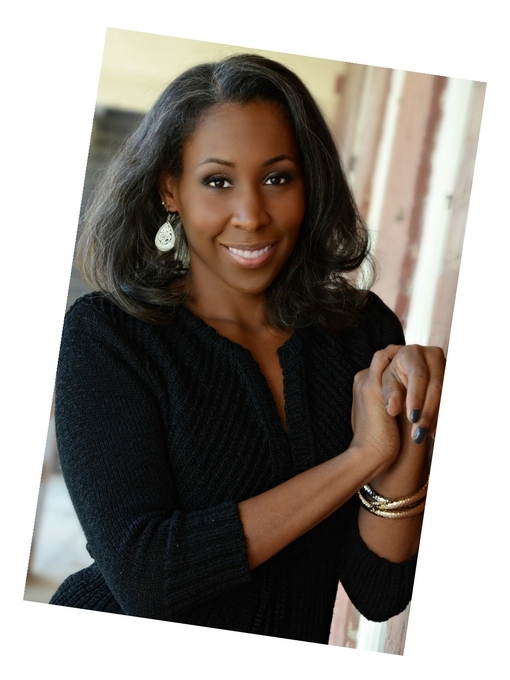 Wife to Will, mother to Jabari and Etana, and child of God; Nettye Johnson is a writer, professional speaker, health coach and educator. She is an energetic ‘sturdy’ girl who enjoys cooking, eating, mind/body exercise, and mid-day naps. Nettye is a lifetime learner gifted to teach. Nettye is a strategic problem-solver, passionate about positive change. 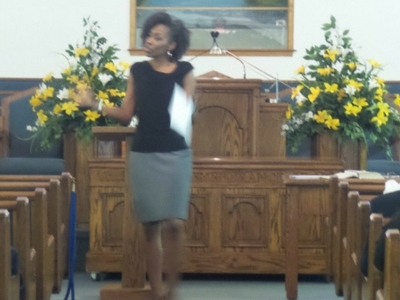 Nettye serves in teaching, youth, and women’s ministry outreach at her local church and state convention. Nettye trains professionals across the nation on leadership and personal development topics. She also operates a holistic health organization that provides curated health education, coaching and programs to help adults find balance and live well. Nettye’s writings on faith, health, and personal development have appeared in Baton Rouge Christian Life magazine and Natural Awakenings magazine. 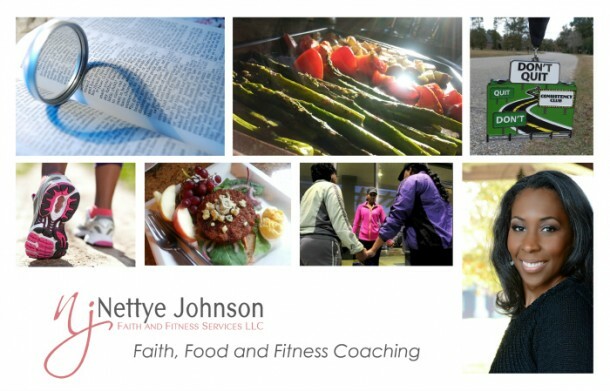 Her first book “Put Your Faith Where Your Fork Is,” shares a faith-based approach to wellness, and her podcast “Faith Applied” explores topics on faith, mind/body wellness, purpose and productivity. Nettye wholeheartedly believes that apart from God we can do nothing and faith without works is dead. Her passion is helping people get unstuck and grow towards their God-given potential. We thank Nettye for all she did to share, collaborate, and bless the attendees and other speakers at our conference. Nettye was the perfect opening speaker, and I look forward to collaborating with her again. 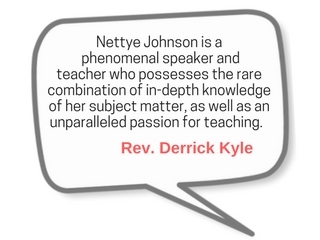 Nettye is a gifted and Spirit-filled woman who always informs, encourages, and inspires whenever she addresses a group. I have been privileged to hear her on several occasions and highly recommend her to any group. She brings a fresh perspective on familiar topics and informs on topics not so familiar. Nettye lives what she teaches! There is no doubt that Nettye is using her God-given gift in a way to impact others. She’s a “natural” and she’s living out her divine purpose! Sister Nettye Johnson is by far the best Presenter I have ever seen in all my years. She is always prepared and she challenges the audience. Her teaching technique in our Sunday School Setting certainly have inspired me to want to dig deeper and deeper!! Her Enthusiasm is Contagious!! As an attorney of 35 years I have seen a lot of presentations. She deserves an A(+) plus. Nettye is a A+ speaker! She was born to instruct & help people live their best life. Of the 7.5 billion people on earth, there is no one like you. Explore elements of your nature, nurture, gifts and abilities, personality, perspective and passions that make you you. Unpack ways to use your unique strengths to fully live your God-given purpose and potential. ‘Too blessed to be stressed’ sounds good, but is not reality. We all experience stress. It is an unavoidable and sometimes helpful response to pressure. Effective stress management can ward off the negative effects of stress and bring positive outcomes including better health and well-being. This workshop explores spiritual, biological, and behavioral principles to help participants identify and better deal with stress in their lives. This education session examines diseases that disproportionately affect minorities, and factors that contribute to these health disparities. Participants leave with assessments, information, and resources that can reduce risks, support change, and improve health/wellness. Culture is a powerful and historically underexplored determinant of health. This training unpacks the influence traditional and current culture has on health beliefs and behaviors. Participants leave and awareness and strategies to create a culture that supports physical, mental, and social well being. Emotional intelligence (EQ) – the ability to understand and manage the emotions of self and others – is a business and life skill linked to high performance. This training defines and develops competence in four core EQ areas: self-awareness, self-management, social awareness, and social management. Snippet of a Weight Watchers scale product presentation on HSN. 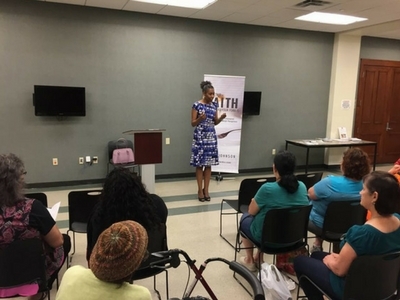 The above sample shows the introduction to a talk on self-care delivered to a group of women entrepreneurs at the A Walk In My Stilettos event in Baton Rouge. The above clip recorded in July, 2016 is my timed speaking demonstration for a speaker coaching workshop at the She Speaks Conference. I prepared a piece on faith and health related to my book, but instead spoke from my heavy heart about race relations and reconciliation. 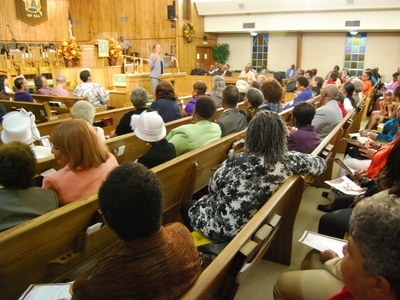 The above video contains excerpts from a 45-minute workshop on family health presented at United Christian Faith Ministries in Baton Rouge, LA. Interested in booking Nettye for an upcoming event? Download her speaker onesheet for more information and complete the booking interest form at the button below. A team member will contact you soon to discuss how Nettye may be of service to you and your group. Thanks for your interest and inquiry!